Electrically conductive, fire rated anti static cases provide permanent static protection. 5 piece MOQ / Many sizes available. Close to carry-on limits this case is ideal for instruments/test equipment. 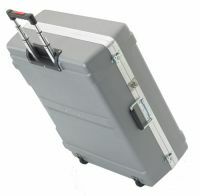 These cases are manufactured with Conductive Plastic to reduce the chance of ant ESD(electro static discharge) events. You are purchasing a Lot of 5 qty. Minimum Order. / Case is Black in color. ASV3418-12 Anti-Static Case Lot of 5 qty. Our ASV 34" x 18" x 12" ID Shipping case can utilized with Pink Anti-Static foam to insure any static charge will dissipate rather than build up. You are purchasing a Lot of 5 qty. Minimum Order. / Case is Yellow in color.